How To Make A Louisiana Stranger Cake For Freezing! Have you ever heard of a Louisiana Stranger Cake? I hadn’t until I stumbled upon this recipe for a moist, tender, bundt cake that is sure to be a hit at your next gathering! This Louisiana Stranger Cake is perfect for a new neighbor, church pot-luck, or to freeze for a future party. If you didn’t already know, I am a collector of cooking, and ANYTHING to do with food, magazines. I use the word collector, but really I have a problem that is teetering on the edge of getting me on one of those hoarding shows where they find “collectors” buried under their belongings along with various pets. Luckily, all my magazines are neatly stacked and they don’t impede the doorways at the moment, but they are getting close. I recently culled and rearranged my collection in a fit of insanity, or maybe it was boredom, or maybe I was just avoiding doing any type of housework or laundry, so they are easier to access. The goal was to get rid of the ones that I wasn’t going to use and to organize my favorite ones and maybe a few that I wanted to re-read. Just take me to the LOUISIANA STRANGER CAKE Recipe Already! If you’d rather skip my (very helpful, I think) tips and tricks, essential cooking info, and similar recipe ideas – and get straight to this delicious easy LOUISIANA STRANGER CAKE recipe – simply scroll to the bottom of the page where you can find the printable recipe card. Where do I find a Louisiana Stranger Cake? This periodicals purge is what led me to the Lousiana Stranger Cake. What really happened was that I threw away 5 of them (those were actually home design magazines) and donated three shelves of actual hardback books to make room for the magazines that were currently residing in my husband’s office. I mean, let’s be real. Who can throw away magazines? One of the few (ahem, all) issues that I kept is an old Cook’s Illustrated that I had received as a promotional issue. I don’t currently subscribe to this one so I have only a few of them and they were either purchased off the newsstand, given to me by my friends, or CI was trying to lure me in because they know that I can’t say no to a food mag. Like most other food magazines, there is a mail section in the front of Cook’s Illustrated where people send in their recipe requests or questions. Some are funny, like “which end of the fork do I use when I eat with it?”, and some are actually useful, like “I lost my grandmother’s recipe for ____ cake and I can’t live without it!” They actually reunite those grieving people with their recipes and achieve superhero status! In an added bonus, we get recipes for cakes we have never heard of before. One such lucky person was brought back from the abyss of sorrow when they found their lost recipe for Louisiana Stranger Cake and CI kindly reprinted it for them. I couldn’t understand this reader’s loss until I read the recipe, made this cake (I already had the ingredients on hand because I love German chocolate cake) and proceeded to eat half of it. The Louisiana Stranger Cake, AKA Southern Praline Bundt Cake, is the moistest bundt cake I ever put in my mouth! I would be dressed in all black and sitting Shiva if I had lost a recipe this delicious! I made it for a church pot-luck and it quickly became my most requested cake. I can’t take credit for this Louisiana Stranger Cake recipe so I am glad to pass it on so that others can revel in the joy of having this cake in their lives! Why is it called a Louisiana Stranger Cake? I really wish I knew where the name comes from because I ALWAYS get asked, and I am sad to say that Cook’s Illustrated did not explain the origins of the recipe in the reader’s mail question or response. A. that it was considered strange to put frosting in the cake batter prior to baking. B. that people brought it to strangers that moved into the neighborhood as a welcome gift. C. that a gifted culinary stranger lost this recipe in Louisiana and a lucky person picked it up! A: Yes, you can! Up to 3 months and it comes out just as moist as when it was cooked. Q: Can I use a different cake mix? A: Yes you can! The original recipe called for a Butter Pecan cake mix but sometimes it is not always available in my grocery store. I have also made this cake with a plain yellow cake mix, just add a teaspoon of cinnamon to the batter. Chocolate is also a great option!! Q: Can you make this from scratch? A: Yes you can! Here is a recipe for the coconut pecan frosting and a cake batter. Q: Can you bake it in another pan other than a bundt pan? A: Yes you can! I have made it as a sheet cake, a 9-inch layer cake, and mini bundt cakes too! Just like my Dark Chocolate Chai Bites. I have made this Louisiana Stranger Cake from scratch before, and it turned out just as tasty as when I used the box mix, so I usually continue to do so. Less mess involved! I have also improvised and used a yellow cake mix, instead of the butter pecan flavored mix, with minimal taste difference. You might want to add a pinch of cinnamon and melted butter in place of the oil, but it works just fine with the original ingredients. 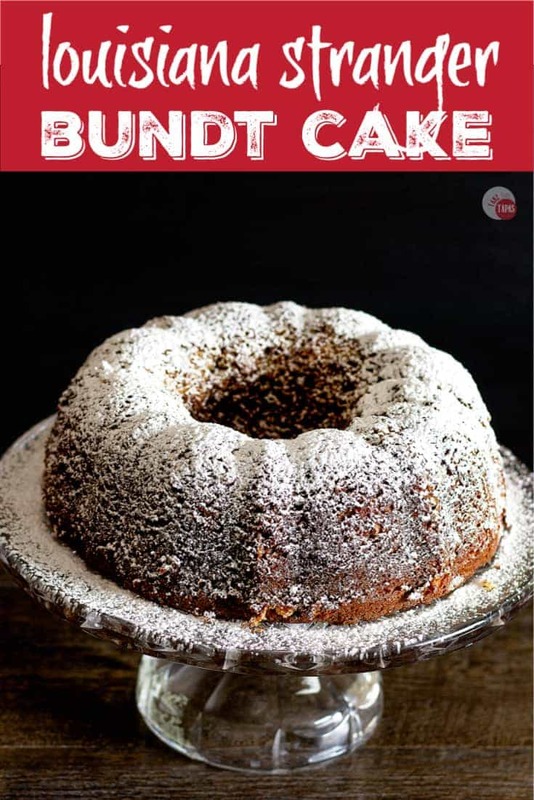 Can any cake be a bundt cake? Only if it is made in a Bundt pan which is a distinctive ring-shaped pan. 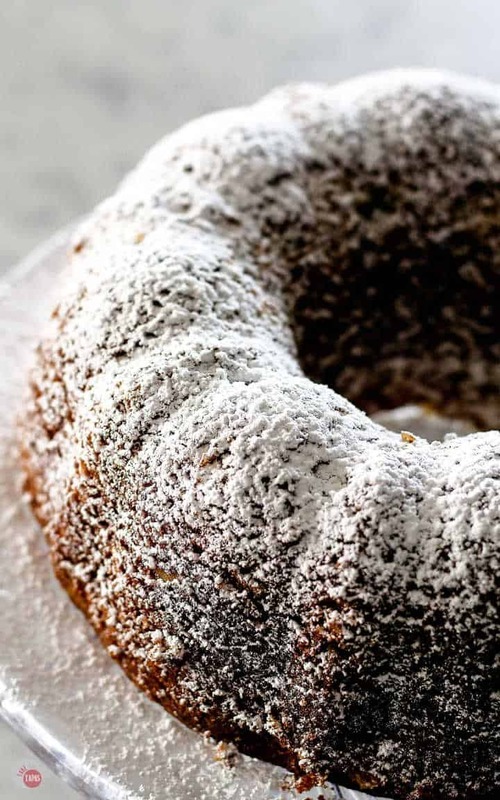 Can you bake any cake recipe into a bundt cake? Yes, the batter for a two-layer, 9-inch cake will fit into a bundt pan that holds 15 cups of batter. Use a good non-stick pan that isn’t scratched, old, or peeling. The non-stick coating must be intact. Grease the pan completely, right before adding the batter so it doesn’t slide down the sides and pool at the bottom of the pan, and use liquid oil/shortening. DO NOT USE BUTTER! And make sure you get it into all the cracks and crevices of your intricately designed bundt pan with a pastry brush if it’s a fancy one! Get the center tube too! Don’t use flour as it gets gummy and comes out like glue, instead I use almond flour or granulated sugar. Yes, sugar is sticky but is liquid when warm so the cake will come out when still warm. As soon as the cake comes out of the oven, take a spatula or non-sharp knife and loosen the cake from the edges of the pan. Including around the center tube! Rest the cake a few before flipping it over and trying to remove it from the pan. You can also, leave the bundt pan inverted on a cooling rack for a few more minutes to see if it will drop out on its own. If the cake still won’t come out, give the pan a tiny shake. 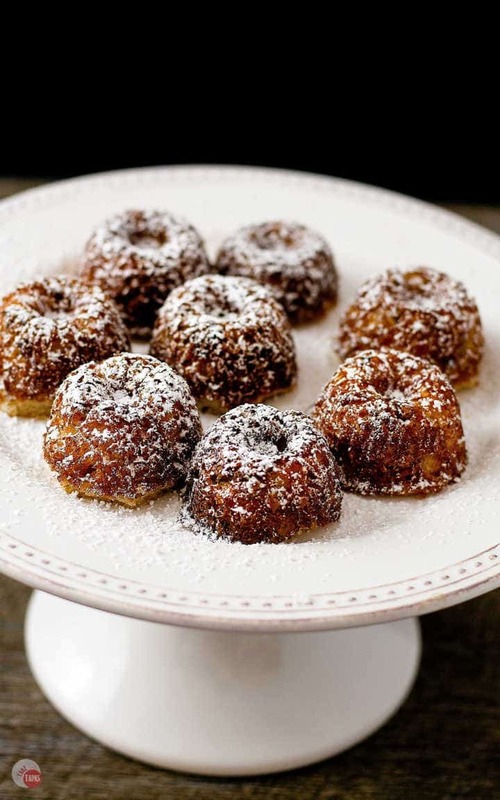 Other great Bundt Cake recipes to try! If you love this LOUISIANA STRANGER CAKE Recipe as much as I do, please write a five-star review in the comment section below (or on Pinterest with the “tried it” button – you can now add pictures into reviews, too! ), and be sure to help me share on facebook! This moist and delicious Louisiana Stranger cake comes together quickly and freezes beautifully! Mix all the ingredients together. Yes, add the frosting to the cake batter! 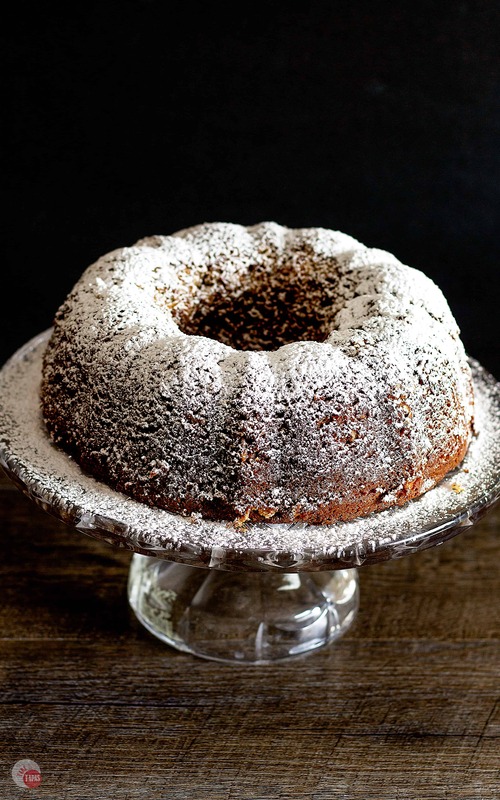 Pour into a well-greased bundt pan. Bake at 350F for 45 minutes (depending on your oven, cook until toothpick comes out clean). Let cool in cake pan for 5 minutes. Invert on a cooling rack and leave in pan for 5 minutes. Dust with powdered sugar to serve or you can wrap tightly in plastic wrap and freeze until needed. The original source of this recipe was Cook’s Illustrated. Tips on Bundt cakes inspired from here. I made this cake and it was such a success at work that I gave the recipe away 3 times! They are still talking about it today! Delicious and easy and moist. Thank you for sharing. Made this cake. I added icing for looks. A friend gave me this recipe about 7 or 8 years ago. Not as a bunch cake but as a cake in a 9×13 pan. No one in this household are big fans of icing so I am all for recipes that make delicious cakes without icing. I have no shame to say another attractive quality is that with a boxed cake mix comes together fast. It is a great cake when you have no time but want a fabulous dessert so share with others or enjoy after dinner with family. I knew the recipe by heart but thank you for sharing so I can share with others. Your bunch cake makes this dessert look even more special than ever. I love to cook from scratch but as a busy mom I am all about taking shortcuts when I can get them in order to focus on more important things, but I really love a shortcut that is very close to homemade. I am so glad to hear about others who have tried this recipe. When I cooked it for the church I used a 9×13 as it was easier to serve. I have also made them in cupcakes and mini bundts! Thank you for reading!! I love everything about this beautiful cake! It’s perfectly lovely for the holidays and I love how easy it would be to make with the assistance of the cake mix too! This smells absolutely wonderful in my oven right now…. it was so easy to mix up and if it tastes even half as good as the batter did Im going to be happy! Ooooh, I may have to rethink my potluck contribution for a party we’re going to this week. This cake looks amazing and super simple to make. Love the adorable baby bundt cakes! Ha! I have bookcases like that – it’s just so hard to get rid of my magazines and cookbooks as I “read” them too! 😀 This cake looks fabulous and I love that you can make it using a mix – bonus! I have never heard of this bundt cake before but I am glad I found the recipe here. 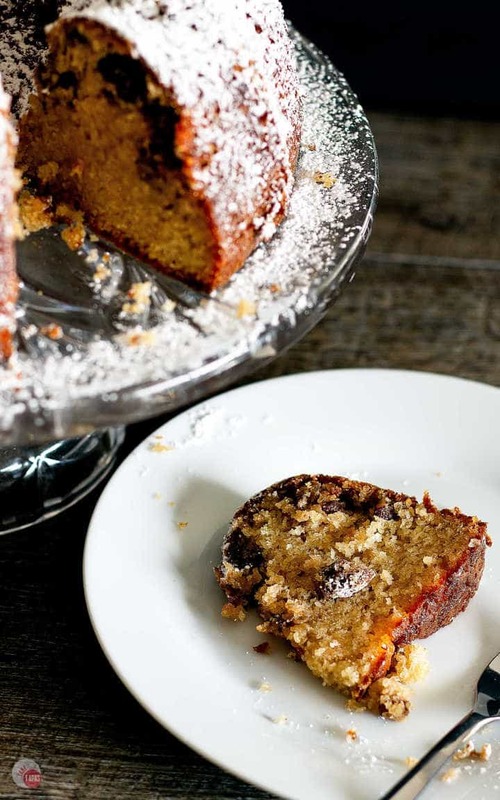 The cake sounds delicious and easy to make – which is always a plus! I had never heard of a Louisiana stranger cake but I’m sold! It sounds so amazing! What a yummy sounding recipe. I’ve never heard of this cake before. I think my mom would love it if I made this for her! Thank you so much Kimmyl! It stays so moist for a while but mine never last that long… Thanks for being a reader! Hi – funny story I was linking up to #SaucySaturday and accidentally clicked on this link in your sidebar but I’m SO GLAD I DID! This lovely cake looks outstanding – going to pin this for the summer time. I can see myself eating this while reading a book and enjoying a glass of lemonade. Thanks for sharing this with us, love it! Thanks so much for that mess up! I love this cake and how easy it is!! I hope you enjoy it along with your Summer reading book! We do not have cake mix in Israel. What can I used instead? Then just add the frosting, oil, eggs, and 1/2 cup pecans to the cake recipe as stated in the original recipe. Good luck and don’t hesitate to email me if you are having trouble still. Thanks so much for reading and ENJOY!! Hey all!!!!! I’m super excited to be baking this tasty cake tomorrow for the first time. I can’t wait to share the outcome on Facebook. Toodles! I am so excited! I can’t wait to hear how you like it! Please take a picture and tag me so I can see it!!!! It is my most popular recipe here in Waycross and people call me all the time to make it for them. Story of my life! I can’t let go! I can look at a magazine 100 times and always find something new to inspire me. I will probably have to get a storage unit soon! Thanks Whitney! It’s my favorite cake! I am so intrigued by this recipe and love that you said “yes put the frosting in”, because I was literally just thinking “Do I put the frosting in?”. I have to try it. Yes, put the frosting in the batter. I know weird! Right?!? I think that’s why it is so moist! What an interesting cake with an interesting name! I’m sure it tastes as good as it looks! Thanks Sara! It is my most popular cake and all my friend’s favorite. This looks so good! A good ol’ fashioned Google didn’t bring up the origins of the name? How strange! I know! I was so intrigued by it! It certainly is the best cake I have ever tasted and would love to know more about it! Thanks so much!! Loved the party! Pecan cake mix can also be found at Kroger’s in Waycross..
You can never go wrong with a Cooks Illustrated recipe! I agree the name is “strange”. I just love that magazine! I love that they are all about the techniques but still want to keep it fun! I have learned so much from them! I wonder how this would be if you used a different cake mix and frosting flavours? Now I’m contemplating all the different combinations! 🙂 Thank you!!! If you check out my dark chocolate chai bites, I do the same thing with dark chocolate cake mix and dark fudge frosting! They turned out great! Want to experiment with more! Thanks for reminding me about this cake! I have made it in the past and add 2 T. of rum to the batter. I call it “Butter Pecan Rum Cake”. I also buy the butter pecan cake mix at Wal-Mart. I sift the powdered sugar over the top right before I serve it. I believe the recipe is called Stranger Cake because if a stranger moved into the neighborhood, you would make this cake and take over to them as a welcome gift. Then they wouldn’t be a stranger anymore. Southerners have always been so hospitable. Can you post the recipe you use from scratch. I don’t like all the additives in cake mixes and ready made frosting. I will post it soon! Thanks for the info! This cake sounds intriguing . However , I dislike coconut to the point I tell people I’m allergic to it. What frosting might you recommend as a substitute to the coconut pecan frosting? I have never tried to substitute the frosting because of the consistency. I have put chocolate frosting in a chocolate cake mix and it turned out great. Maybe a vanilla one. I think I would probably only put half and then substitue the other half with caramel sauce? I will have to play with the recipe. Have you ever made the frosting from scratch? You can do that and just leave out the coconut. That is very interesting! I bet that would work great! Your recipe calls to caramel coconut pecan frosting. Is this the same as the coconut pecan frosting for German Chocolate cakes? My mother in law has had this recipe for many years, and it is indeed scrumptious. But we haven’t been able to find butter pecan cake mix in 5 or 6 years. Where are you able to buy it???? I can only find it at Walmart here in Waycross and only every now and then. When I can’t get it, I use the golden butter one and add some extra pecans and a touch of cinnamon. Thanks for reading! After I posted it my MIL then informed me that she had the recipe from a friend of her’s in Kentucky but couldn’t remember what she called it. Funny how those tried and true recipe come back around and around! It’s amazing how a cake can look that good with such few ingredients. I bet it tastes even better! Thanks so much for sharing it. I like that it freezes well and stays moist! This looks absolutely FANTASTIC. I’m amazed at how minimal the ingredients are! Being originally from Louisiana, the name of this recipe really caught my eye. This cake looks absolutely delicious, I’m looking forward to trying it. By the way, I love that first section of Cook’s Illustrated too, there’s always something interesting there. Thanks Joanie! Let me know if you ever find out why it’s called a stranger cake. I would love to know! This cake looks beautiful, and sounds enticing! I hear you about donating old books/magazines. I tend to copy out a couple from each magazine I am interested in and then get rid of it. Maybe when I have a pantry I will have more room to store them. Oh boy… I was going to go have a healthy lunch but now I just want to go bake this cake. What have you done??? I love lost to found recipes with odd names. This one is pinned so I won’t ever loose it! Thanks Mirlandra! Found recipes from old books and magazines are my favorite! It seems like they are always the most creative. I always wonder how some people come up with some of the ideas! Thanks Heather! That is what intrigued me most about this recipe. I have tried it with chocolate cakes too and it works great! It is! I had to take the cake to the gym after I took the photos just so I wouldn’t have the temptation! Thanks for taking a peek at the recipe and I hope you try it at home soon. It was nice to hook up. 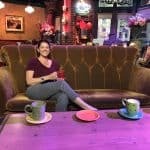 I love your blog and could get some photo tips from you. Your lighting is always perfect!